Color: Keep as shownUse my color scheme (+10.00) Line 1: Line 2: Line 3: Line 4: Line 5: Line 6: Line 7: Line 8: Line 9: Line 10: Oh phooey! This item is currently out of stock. 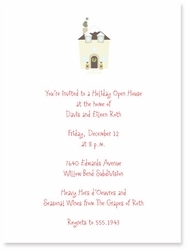 Description: Host a holiday open house with this Christmas version of our popular moving announcement.